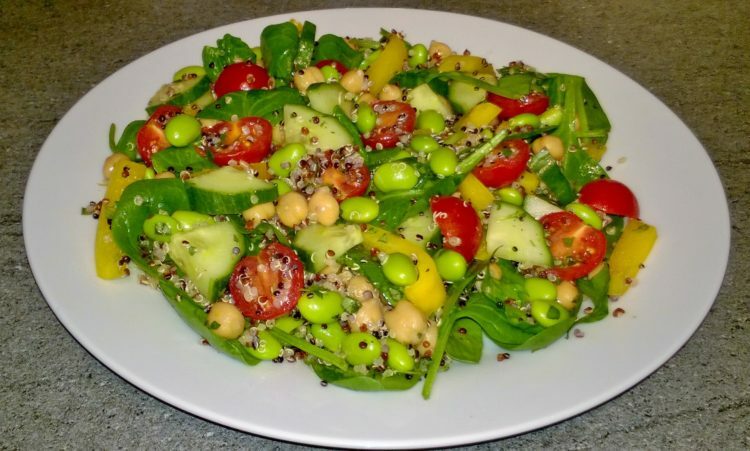 This tasty salad is high in protein and will keep you feeling fuller for longer. 1 Cook the quinoa according to the packet instructions. When cooked to aside and allow to cool. 2 Place all the ingredients for the dressing in a jar with the lid on and shake or in a jug and mix well. 3 In a bowl add the cooled quinoa, chickpeas, edamame beans, yellow pepper, cucumber, tomatoes and mix. 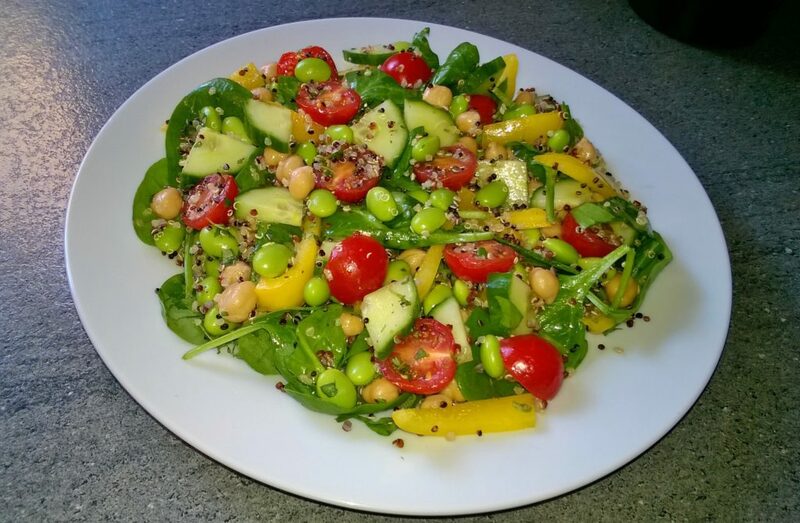 4 Place the baby spinach on a plate and add the quinoa chickpeas, edamame beans, yellow pepper, cucumber and tomatoes mix on top of the baby spinach. 5 Drizzle the dressing all over the salad, then serve and enjoy. Quinoa is a seed but eaten like a grain which is gluten free, high in protein, essential amino acids, iron, magnesium, fibre and anti-oxidants. It contains vitamin-E, copper, calcium and potassium. Chickpeas like other legumes such as beans, peas and lentils they are high in protein, vitamin-C, iron and fibre. Baby Spinach low in calorie its high in iron and anti-oxidants like vitamin-A, vitamin-C, vitamin-K, B-complex, niacin and ometa-3 fatty acids. Cucumber is a low calorie fruit, the skin is a good source of dietary fibre and potassium which helps to control blood pressure. They also contain anti-oxidants, beta-carotene, a-carotene, vitamin-A, vitamin-C and a high amount of vitamin-K.
Yellow Pepper helps slow down aging, boosts cardiovascular health, enhances your immune system and lowers cholesterol. It contains fibre, beta-carotene, vitamin-C, vitamin-A and Lycopene which gives it the colour and helps prevent prostate cancer and heart disease. Lemon Juice not only does it cleanse the body of toxins and radiation, it is well known for its antioxidants and anti-inflammatory benefits, it helps strengthen immune system. It is also rich in vitamin-C which has anti-cancer properties, when drizzled on spinach or leafy greens it helps our body absorb the iron. Thyme Herb has one of the highest antioxidant levels among herbs, contains thymol an important essential oil with antiseptic and anti-fungal properties. It is packed with essential vitamins and minerals like potassium, iron, calcium, manganese, magnesium, selenium and beta carotene along with vitamin-A, vitamin B-6, vitamin-E, vitamin-C helps which your body resist infectious agents and vitamin K.
Cherry Tomatoes/Tomatoes contain protein, fibre, vitamin-C, vitamin-B6 important for brain function and vitamin-A which keeps your eyes, heart, lungs and kidneys working properly. Extra Virgin Olive Oil is one of the healthiest edible oils it contains mono-unsaturated fatty acids which lowers cholesterol and has omega-3 & 6 along with a large amount of anti-oxidants, vitamin-E and vitamin-K It is an anti-inflammatory, helps against heart diseases, strokes, cancer and Alzheimer’s.